Collins was indicted on charges that he used inside information about a biotechnology company to make illicit stock trades. 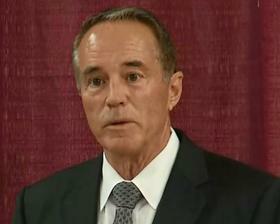 Chris Collins has denied any wrongdoing. Chris Collins, his son Cameron, and Zarsky all pled not guilty on Wednesday afternoon. They were released on $500,000 bond (each) and their own personal recognizance. Collins was first elected to the 27th Congressional District seat in 2012. He faces opposition this year from Democrat Nate McMurray and Reform Party candidate Larry Piegza. The district includes all Orleans, Genesee, Wyoming, and Livingston counties, with parts of Erie, Monroe, Niagara, and Ontario counties. It is not immediately clear what the process will be now for Republicans. Monroe County GOP Chair Bill Reilich said that Republican leaders across the 27th Congressional District are evaluating several "highly qualified individuals." But state election law has certain specific instance in which a candidate, such as Collins, could be removed from the ballot at this point in the year. Those include if the candidate dies, runs for another office, or moves out of state. Nazareth College political science professor Tim Kneeland says because House Speaker Paul Ryan and other Republicans showed “less than tepid support” for Collins, it probably pushed him out of the race. He says the process to get Collins off the ballot now, because it’s so complicated, could end up in court. The Buffalo News reports there are a number of Republicans interested in running for the seat. At this point it is still unclear how Republicans can put a new candidate on the ballot -- and who that candidate will be. Stefan Mychajliw, the Erie County comptroller, jumped into the race Saturday. Bridgett Bowman is a political reporter for Roll Call in Washington, D.C. She told Buffalo public radio station WBFO that it would likely have been easier for McMurray to run against Collins, because of the indictment hanging over him. She says if a more "generic" Republican is able to run for the seat, that would probably make it tougher for the Democrat, McMurray, because it has been a staunchly Republican district.